The Lexus IS sedan comes with a 241 hp 2.0-liter turbo charged unit or a 3.5-liter V6 in 255 hp (IS300) and 306 hp (IS350) versions. A 6-speed automatic transmission is standard while the range-topper gets an 8-speed unit. A spacious interior and standard features like power front seats add to the luxurious feel of the IS and a comfortable ride and refined cruising ability make this a compact executive sedan that comes well recommended. Don’t spec too many extras and the pricing remains competitive too. For a brand that was founded with the intention of showing up the German sedan makers at their own game, Lexus has had a fairly hit-and-miss history when tackling the likes of BMW, Audi and Mercedes-Benz at their own game. Sure, the LS has been a capable car since forever, but the rest of the range has struggled to keep up with the competition. To counter that, Lexus has updated its IS sedan, in order to give this compact executive car the spindle grill teeth to sink into the and Audi A4 (as well as more recent rivals like the and ). All of the changes have undoubtedly made it a better vehicle, but are they enough for the Lexus IS to close the gap to the class leaders? Much like the exterior design, the interior of the Lexus IS sedan is one of the more controversial you’ll find on the market. It’s nothing to do with the quality or the fit-and-finish – on the contrary, it’s a beautifully crafted and assembled interior, with lots of leather and high-grade materials (we especially love how the analogue clock and dashboard air vent surround is milled from a single block of aluminum). Put simply, it’s enough to make the interior of the BMW 3 Series look rather drab in comparison, and it’s certainly appropriately trimmed considering the Lexus IS has a starting sticker price of $38,275. What’s riled so many up about the Lexus IS’s cabin is the incredibly fussy control layout. There doesn’t appear to be much cohesion with the button placement, and the computer mouse-esque multimedia interface device on the center console is far less intuitive to use on the move than more conventional systems found on rival cars – whether they’ve adopted a center console-located rotary dial control scheme (BMW 3 Series, Audi A4, Mercedes-Benz C-Class) or a touchscreen system (Cadillac ATS, Jaguar XE, ). Thankfully, the Lexus IS makes up for this by being quite a spacious compact executive sedan. Granted, it’s not as commodious as the , but there’s a decent amount of head and leg room for rear passengers in the Lexus than in the rather snug Jaguar XE. Plus, the standard-fit power adjustable seats means the driver and whoever’s riding shotgun can get nice and comfy, and there are loads of sizeable storage cubbies (glove box, door bins, that compartment under the front center arm rest, etc.) Trunk space is also fairly respectable, if again not quite up there with the most practical cars in this segment. Despite the 13.8 cubic feet capacity (which lags behind the aforementioned Audi’s 17 cubic feet of trunk space), there’s enough room – and enough of a trunk lid opening – to squeeze two sets of golf clubs in. Also helping the Lexus IS’s trunk space is the standard-fit 60:40 split-folding rear seat arrangement, which is quite an important feature to point out considering some rivals don’t come with split-folding seats unless you pay extra or go for a more expensive trim package. Lexus has decided to take a more comfort-orientated approach to the current car. Despite targeting the prior two iterations of the IS sedan against the sporty class leaders, Lexus has decided to take a more comfort-orientated approach to the current car. Even before the mid-life refresh (which, we hasten to add, didn’t actually change much that’s worth talking about), Lexus has very clearly aimed this third-generation IS at the sort of driver who’d prefer a nice and comforting cruiser to sooth a fevered brow on the drive back home after a long, hard day at the office. Maybe this was to give the breathing room for the (a car that shares quite a lot of mechanical components with this sedan), but it does mean the Lexus IS is a far more appealing ownership prospect to buyers who don’t place driving dynamics or steering feel as a high priority. The ride quality, for instance, is especially well judged (as long as you steer clear of the ‘F-Sport’ trim, which ruins all that with its firmer suspension setup). Admittedly, there is a whiff of body lean around higher speed sweeping bends, but the Lexus IS remains resolutely flat and level in most other situations, and manages to smooth out all but the roughest of asphalt road surfaces you’ll find in the United States. Having such a cosseting ride would be worthless if you spent your time behind the wheel in a road roar echo chamber. Thankfully, Lexus has dealt with that predicament by stuffing the IS with copious amounts of sound deadening – resulting in a cabin that’s serenely quiet. Only a hint of wind whistle around the door mirrors and front post interrupt the otherwise ghostly quiet cabin, and it’s overall a highly commendable accomplishment. 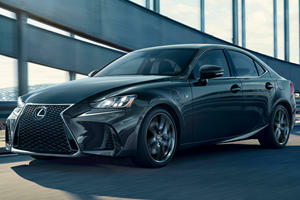 This focus on comfort, however, does mean the Lexus IS is far from being the drivers’ choice of compact executive sedan. Whilst it’s by no means a horrible car to drive, the Lexus doesn’t steer with the same spirit, response and dynamism that, say, a Jaguar XE or . Another possible detriment to the Lexus IS is that the Jaguar and Cadillac (along with quite a few other cars in this class) are still very comfy cars, in spite of their more sporting chassis setups. As we said earlier, we doubt many will mind too much about the Lexus IS being one of the softer and squidgier cars in this segment. We just think it’s worth pointing out that quite a few cars can run the Lexus fairly close in terms of comfort, without having to compromise on a direct and engaging driving experience. Remember the we mentioned earlier, and how it shares a lot of features with the IS? Well, a good chunk of those cross-model components regard the engine and transmission options – so, if you’ve also been looking around the svelte coupe as a wild card alternative to the IS sedan, you’ll find yourself staring at almost identical spec sheets. For those who haven’t visited a Lexus dealership or toyed around with the firm’s online configurator yet, here’s a quick rundown of what engines you’ll have to choose from. If you have your heart set on a diesel or hybrid power for your next compact sedan, however, we’ll save you from scrolling down further by saying you should ignore the Lexus IS entirely, as it only comes with gasoline engines. Those engines are, though, fairly good – mainly because they suit the Lexus IS’s more relaxed character so well. Whilst the smallest engine available (a 2.0-liter turbocharged four-cylinder with 241hp) can sound a bit coarse when it’s being worked really hard, all of the engines have a wide torque band and are rather hushed and refined when you let them murmur along at highway cruising speeds. If the Lexus IS was a sportier sedan, we probably would recommend the 350. For most buyers, we reckon that ‘IS 200’ four-cylinder engine is the one to go for. Not only will you net yourself at least $1,975 by going for this one instead of the next engine option up the list (a 3.5-liter ‘IS 300’ six-cylinder that’s only more powerful by just 14hp). It’s comfortably the most efficient engine option in the range too, thanks to its claimed economy figures of 22mpg for the city and 33mpg for the highway (for comparison’s purposes, a like-for-like Mercedes-Benz C-Class can return 24mpg and 35mpg on the city and highway respectively). Should you require six-cylinder grunt, though, you’ve got another 3.5-liter to choose from, – but this one, dubbed the ‘IS 350’, has a far punchier output 306hp and, according to Lexus, no penalty in terms of fuel consumption (both 3.5-liter engine options can return 19mpg on the city and 26mpg on the highway). It’s also worth pointing out that the pokier unit gets an eight-speed automatic that’s slightly smoother than the other option’s six-speed transmission. All that’s holding the halo engine back from being the definitive 3.5-liter option is the price: even without the optional all-wheel drive option that adds nearly $2,200 to the MSRP (it’s standard fit on the IS 300), the IS 350 is still the pricier car by more than a grand. If the Lexus IS was a sportier sedan, we probably would recommend the 350 – but, as that’s not the case, we don’t feel it’s entirely worth paying the extra money for. Sticking to that ‘value for money’ theme brings us nicely on to the options list for the Lexus IS. As with tons of other cars in this class, you can really bump the car’s price up if you don’t pay close attention to the rapidly increasing MSRP. Thankfully, it is possible to get a nicely specified IS without paying an extortionate amount of money. 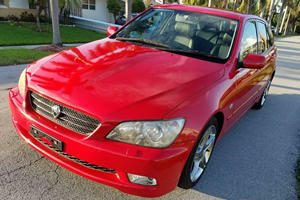 It certainly helps that the Lexus IS comes with a good amount of equipment as standard. All models get dual-zone climate control, on top of electrically-operated front seats, Bluetooth connectivity, a complement of 10 airbags (one of the driving factors behind the Lexus IS’s five-star safety rating) and faux-leather trim that’s of such a high quality that you won’t miss the real leather trim that’s locked behind the optional Luxury Package’s rather considerable $4,385 paywall. Other options, though, do have their merits – especially the ones that aren’t outrageously expensive. Adding a rear view camera, for instance, only increases the list price by another $350, so it’s a relatively inexpensive way to make up for the Lexus IS’s lack of standard-fit parking sensors (they’re a $500 extra, if you’re interested). Likewise, the $500 radar-guided cruise control system also isn’t too pricey, and may be worth considering if you frequently make longer journeys on highways and the like. The rest of the extras, though, are harder to recommend. For instance, that Luxury Package’s extortionate price is even more difficult to justify when a majority of the more enticing features it contains (namely the heated seats and blind spot monitoring system) can be added to the car through additional packages and still end up being cheaper. Likewise, all-wheel drive is an expensive extra on the IS 350 that we feel you should ignore unless you really need the feature, and the $2,715+ F-Sport Package is incredibly difficult to recommend when the only points are a sportier bodykit and a fancy dashboard display. No matter how many optional extras you put onto your Lexus IS, you’ll still end up with a car that remains similarly priced to its competitors. Though that does sound promising for the Lexus on paper, it does also means it can’t pull out the MSRP undercut that, in a class as competitive as this, would have given the IS a real edge over its adversaries. 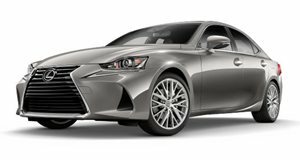 In the sub-heading of this review, we put forward the following question: “Are bold looks and a comfy ride enough to make the Lexus IS a great compact sedan?”. We’re sure you’ve been dying to know the answer, so we’re happy to relieve you of that tension and say...yes, they are enough. 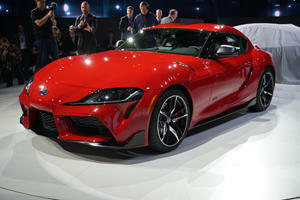 The thing is, though, it’s not enough to make the Lexus IS the top car in this segment. It’s not because it’s bad in any way – apart from handling dynamics, it only trails its ever-so-slightly-superior competitors by the slimmest of margins. But this is a highly fought-over class we’re in, so any deficiencies are going to be faced with intense scrutiny – and the Lexus IS sadly has too many for us (whether they be fuel economy, fun behind the wheel and outright space) to recommend the car over its more well-rounded rivals. By all means, though, do check the Lexus IS out if you’re starting to shop around for your next compact executive sedan, as it’s a genuinely good car. If you’re looking for the outright best example of a compact executive sedan on the market today, however, we can’t honestly say you’ll find it in the Lexus IS. A BMW engine powering a future 3 Series fighter? Really? Only this one isn't officially a Lexus.